After a large number of Lee Perry and Bunny Lee compilations on UK reissue giant Pressure Sounds one might think that the vaults would be more or less empty by now. But no. That wasn’t the case on Pressure Sounds’ mighty Bunny Lee compilation Next Cut! released a few months ago, and that’s not the issue with yet another set shining light on Lee Perry – one of the most innovative producers in popular music. 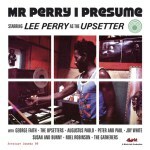 Mr Perry I Presume collects rare tracks and exclusive mixes, mixes that were only ever heard by those that went to particular sound system dances. The tracks range from remixes and existing classics to obscure cuts that never reached the shelves. Included are recordings from the period before and during Lee Perry’s Black Ark studio.